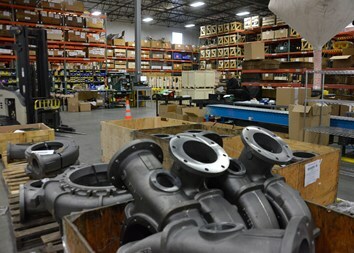 Pioneer Pump’s superior hydraulic performance may begin on the engineers’ drawing boards, but it’s fully realized in our manufacturing center. From the time we sit down with you to determine the best pump for your application, until we deliver a pumpset that exactly meets those needs, we infuse quality and innovation into every step. Our specially designed manufacturing facility was completed in 2007 and includes 43,000 square feet of climate-controlled assembly, programmable fabrication, CNC and DNC machining centers and a world-class test facility. Every pump is built to rigorous standards with premium materials, utilizing a modular design concept, pressure-tested and spun-tested to ensure a superior product. Taking quality as seriously as we do, we’ve fully outfitted our state-of-the-art, 45,000-gallon, 24" closed-loop test facility with the most modern test equipment available. Our 600 horsepower variable frequency control panel allows Pioneer to simulate almost any system up to 20,000 gallons per minute and 300 psi. We have incorporated a 30-foot-deep sump that allows for true lift testing and reprime testing of our products. This test facility, coupled with our high-tech instrumentation, allows us to rigorously test to Hydraulic Institute and International Standards Organization standards. Our CNC / DNC machine shop, which includes numerous vertical and horizontal machining centers, allows for very precise machining of raw materials, including those components requiring .0005 tolerances. Pioneer incorporated significant air filtration equipment into our facility, as well as a world-class paint booth, to ensure a product that looks as good as it performs.